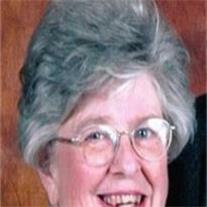 Beverly Ann Hartmann passed away quietly in her home Monday, February 20, 2012 at the age of 75. Beverly was born on March 30, 1936 in Michigan City, IN where she graduated from Elston High School. She married Donald Lee Hartmann on June 19, 1954 and they spent 57 glorious years together in Indiana, Illinois, Virginia, Wisconsin, then retiring to Mesa, AZ in 2000. Beverly graduated from Madison Area Technical College (MATC) in 1980 with a degree in Interior Design where she applied her talents to a wide range of home and building clients. Beverly is preceded in death by her sister Marlene, daughter Angela and her cherished dog Oliver (Ollie). She is survived by her husband Donald; brother Wynne Grain; children Sandra, Brenda, Douglas and Stephen; 7 grandchildren; Megan, Chad, Evan, Andrew, Hannah, Amanda, & Sara; two beloved pets Jasper and Echo, and many special friends. Beverly cherished her membership in the LDS Church where she served in many capacities including service as a Temple Worker. Beverly will be remembered by her loved ones and dear friends as a Humorous, Vibrant, and Quick Witted young lady. Visitation will be Thursday February 23, from 6-8PM at Bunker’s Garden Chapel, 33 N. Centennial Way, Mesa, AZ 85201. Funeral services will be Friday, Feb. 24, 2012 at 11 AM, preceded by a visitation at 10 AM at the LDS Aspen Ward, 1249 S. 48th St., in Mesa. Interment will follow at the City of Mesa Cemetery. In lieu of flowers the family requests that donations in Beverly’s name be made to the Arizona Humane Society located at Campus for Compassion, 1521 W Dobbins Rd Phoenix, AZ 85041.